Instant Listings! Parkes Auctions & Appraisals is frequently updated with our latest auctions in the area, be sure to back often to keep up-to-date! Find Parkes Auctions & Appraisals on Facebook! PARKES AUCTIONS & APPRAISALS is a family owned and operate business located in central PA, Mifflin county. Parkes Auctions & Appraisals takes great pride in its customized approach to the auction business. They realize that whether you are selling a large real estate tract, high end collection, family farm, or a loved ones estate, emotions are at a all time high or low. This is why everyone at Parkes Auctions does everything they can to customize the experience to your, the sellers, individual needs. PARKES AUCTIONS & APPRAISALS specializes in helping to settle ESTATES, ANTIQUES & COLLECTABLES, REAL ESTATE from rentals to large land tracts. With growing up and still helping to work the family farm, Travis has extensive knowledge of local agriculture, from planting to feeding to spreading –it, he can help with your needed appraisals or the unforeseen dispersal. Now with the new Auction House up and running on Main Street in Yeagertown, Parkes Auctions can also take you consignments and have some place to go with your ESTATES. So stop in and enjoy the AUCTION EXPERIENCE there is plenty of seats and good food. PARKES AUCTIONS & APPRAISALS is lead by auctioneer Travis Parkes. 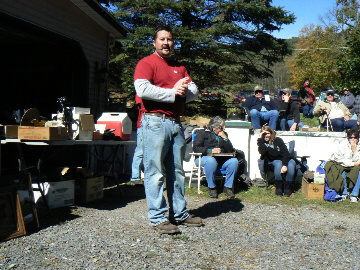 Travis obtained his auctioneers license in the fall of 2011 from HACC one of only two PA accredited schools at the time. He is also a member of Pennsylvania Auctioneers Association (PAA). Member of Pennsylvania Auctioneers Association (PAA).